Completed as a passenger cargo ship in 1936 for Osaka Shoshen Kaisha (OSK) Line. Her sister was TOKYO MARU. 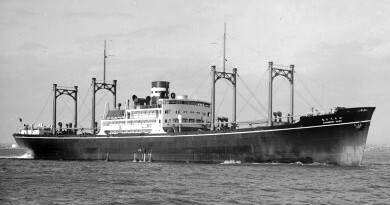 CANBERRA MARU was sunk by American aircraft off Guadalcanal. TOKYO MARU was requisitioned by the IJN as an auxiliary transport in Dec '41 and torpedoed and sunk by an American submarine in Nov '43. Speed: 14.5 knots cruising, 19.2 knots max.